Thursday March 14, 2019-Media practitioners have warned religious leaders against threatening and harassing journalists who pursue incriminating stories about them. Speaking under the auspices of the Kenya Media Sector Working Group, the group singled out rogue Prophet David Owuor of the Repentance and Holiness ministries and his counterpart, Pastor James Ng’ang’a, of the Neno Evangelism ministry. They accused the duo of mobilizing their followers to embark on smear campaigns online against journalists while warning them of dire consequences. “The KMSWG takes great exception to such behavior from the religious leaders and draws the attention of the National Police Service and the Director of Public Prosecution to the actions of these said religious leaders especially their issuance of threats direct threats to journalists as well as online bullying by their followers,”read part of the statement. Prophet Owuor and Pastor James Ng’ang’a have made headlines lately following exposés in mainstream media that caused the public to raise eyebrows on how their ministries operate. 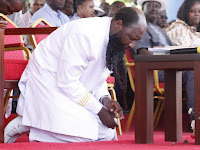 The post Rogue Prophet, OWUOR, and con Pastor, NG’ANG’A will regret attacking journalists after they exposed their conmanship-See Media groups has done to them appeared first on Kenya News Alerts.